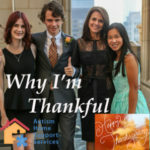 Thankful for autism? That just didn’t seem possible when my son was first diagnosed. But as the years have passed and my “world” of autism has grown, I can’t help feeling anything besides gratitude. As we are fast approaching Thanksgiving, it seems an apt time to step back and think about what we’re thankful for. We reached out to some of our AHSS team members and asked them to share what they’re most thankful for in being moms of autism.